Floyd Mayweather should retire after Saturday's super-fight against Manny Pacquiao, according to his father. 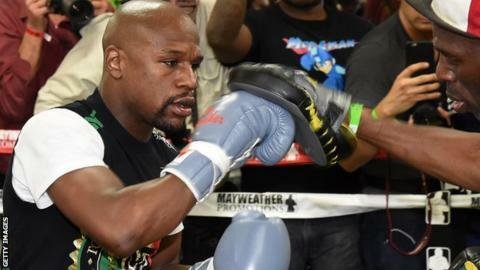 Mayweather, 38, has said he will fight one more time after the clash with Pacquiao at the MGM Grand in Las Vegas. The unbeaten American's fight with Pacquiao is the fifth of a six-fight contract with broadcaster Showtime. "I hope he walks away after this fight," said Floyd Mayweather Sr. "This is a gambler's game and I don't think Floyd should be gambling too much." WBA and WBC champion Mayweather has won all 47 of his fights, 26 by knockout, in his 19-year professional career. After his defeat of Oscar De La Hoya in May 2007, Mayweather relinquished his WBC light-middleweight title, only to come out of his brief retirement in July to announce his fight with Britain's Ricky Hatton. Mayweather also retired in 2008 but returned 21 months later in May 2009 to fight Juan Manuel Marquez. The fight against Pacquiao is expected to be the richest in the history of boxing and the fighters will walk away with about £200m between them. Speaking to the Sunday Telegraph, Mayweather Sr, 62, added: "Once you reach that pedigree and make that kind of money, you don't have to fight no more. "Whenever you get in that ring, anything can happen. It looks easy but it ain't as easy as it looks. He makes it look easy."